Some highly recommendations i want to make before you go out spend your hard earn money based purely on a review. The main reason for the above is purely to protect your purchase investment. How many times have you purchased something online then to notice it was not what you expected or not quite right ? Its very hard to then return something from international online stores, not to mention it costs you more money in return postage. I purchased this set of speakers from none other than my best friend Office Works. Why, because they allow exchange, refunds with a receipt. They also dont ask you 100 questions when returning goods. As long as the item is good resell-able condition your ok.
After testing the Edifier s25 i was expecting something as good if not better because a few reviews did infact review these speakers as being a little bit better. Woofer seems to be located on the bottom of the speaker, this most likely was done to give a better base response due to the enclosed nature of the speaker facing down towards the surface. The problem is though is that i could not help but notice a rumble on my desk and feet which was annoying to say the least. Who wants to feel their desk shake even at low volumes whilst working and listening to music ? The speakers are loud, just depending on the music you want to play will determine how loud you can go without distortion. 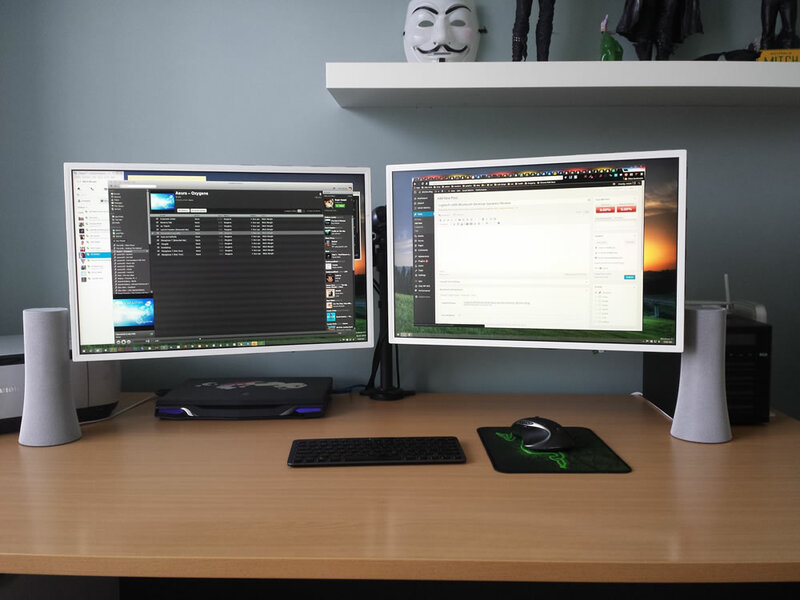 They seem a bit light on holding each speaker in your hands, compared to the Edifier’s, but there is a trade off here, they are compact so you cant have both. The cable length does not seem to be long enough they are OK probably about 1.5 meters each speaker cable in length. If they were longer it would of been better as you would have more option for speaker placement. The rubber grommets on the back that protect the ports have no latch to easily open then you need to have a pin or a sharp object handy to get to them easily. They are compact round cylinders so they will fit into any work space no problems. There is no exposed parts, you cannot see the speakers themselves and it does not seem like you can remove the coverings. This can be good and bad depending on how you see it. 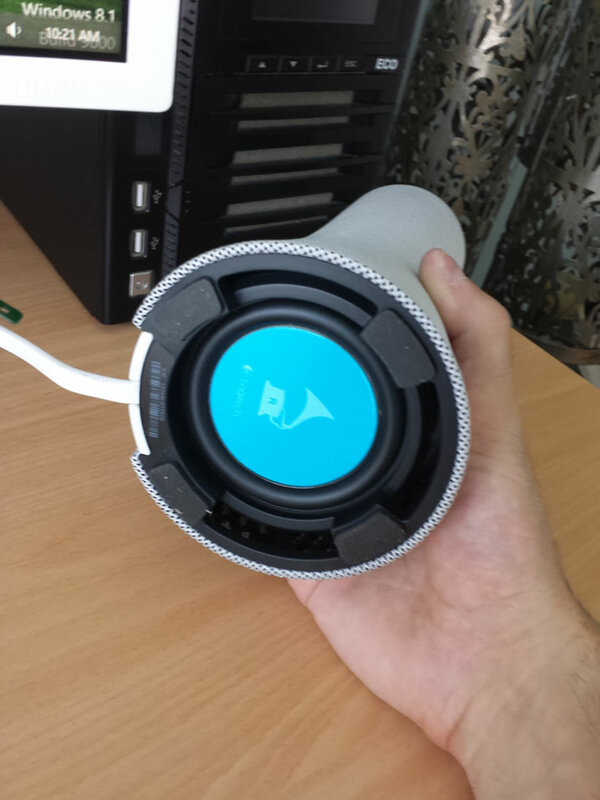 The design of the speakers are like a cylinder on your desk you have no option to tilt them up. This probably means that the sound ends up coming through the speakers in a straight direction. If you think about it when your sitting at your desk the sound should be slightly faced upwards to hit your sweet spot (your ears) giving you a richer sound overall. Because they are round cylinders and because the speaker covering pretty much goes all the way around, it is hard to know when the speaker is actually facing your direction properly. The only reason i had to give this a bad score is because i simply could not get multiple devices connected at the same time and playing successfully, there is no support forums about it on the logitech forums and i tried for an hour to get this working successfully but it never worked.Actual bluetooth connectivity was easy and seemless, Windows 8.1 found the speakers very quickly and connected with no problems. The problems started when i wanted to connect a second device.These speakers are suppose to be able to pair 8 devices and have 3 devices connected simultaneously. This is fantastic (if only it worked).Once i had my first laptop connected and i then attempted to connect my Samsung Galaxy s4 it connected successfully, but when i went to play something i heard no sound.I went to my computer pressed paused, then came back to my phone pressed play and boom i heard the sound. I think thought wow its working, i pressed paused on my phone, pressed play again on my computer and i had no sound. This is when the issues happened, i had to disconnect reconnect to get sound again from my laptop and once that happened i had to to the same to the phone.This kept going on and on, WHY.This cant be this hard, the instructions are simple, pair both and press play and pause on each device the speakers will auto sense what is being played and only route the sound being played at once. Well in the end i gave up, it never worked. Considering these speakers are suppose to have this feature and they never worked for me it can assume this is a bug. It may work for you, maybe its my environment, but in the end this should of never happened and probably a bug in the software / drivers. Well i have been using these speakers now for a good few days, switching between applications such as Spotify and Youtube and other apps, i have noticed a bug. Sometimes when in an app and you pause the music and switch to something else eg…. YouTube it will not switch the sound to bluetooth speaker it will revert to the internal laptop speakers. Hmmmmmm, does not always happen but another sign off some bugs. These speakers are nice and for $149 AUD from your local office works are a decent buy. I am not entirely sure i would keep them for the fact that i think i do not like the cylinder shape much. I tend to like to see the speakers or at least have the option to remove the covering. The sound is good, but i think that the base rumble on the desk will become a bit of a distraction for extended listening. The fact that i could not get multiple devices connected at the same time means there is a problem, i do not want to spend my time troubleshooting, it should work out of the box. NOTE: I am in no way affiliated with Logitech this is an honest and unbiased logitech z600 bluetooth desktop speakers review, i bought the speakers myself.